Right off the freeway, India Palace may not exactly look like a palace. But, don’t judge this palace by its cover. The food is very good. I am not an expert by any means in Indian food. But, I do know when something is cooked correctly. I had the Rogan Josh which is lamb cooked in a yogurt sauce and special spices. I thought the lamb was cooked correctly and fell apart when cut with a fork and I liked the spice blend that they used. It helped the cold that I had. I also ordered Roti and garlic Naan. I liked the Nann better, it was a little lighter. Don’t forget the beer. 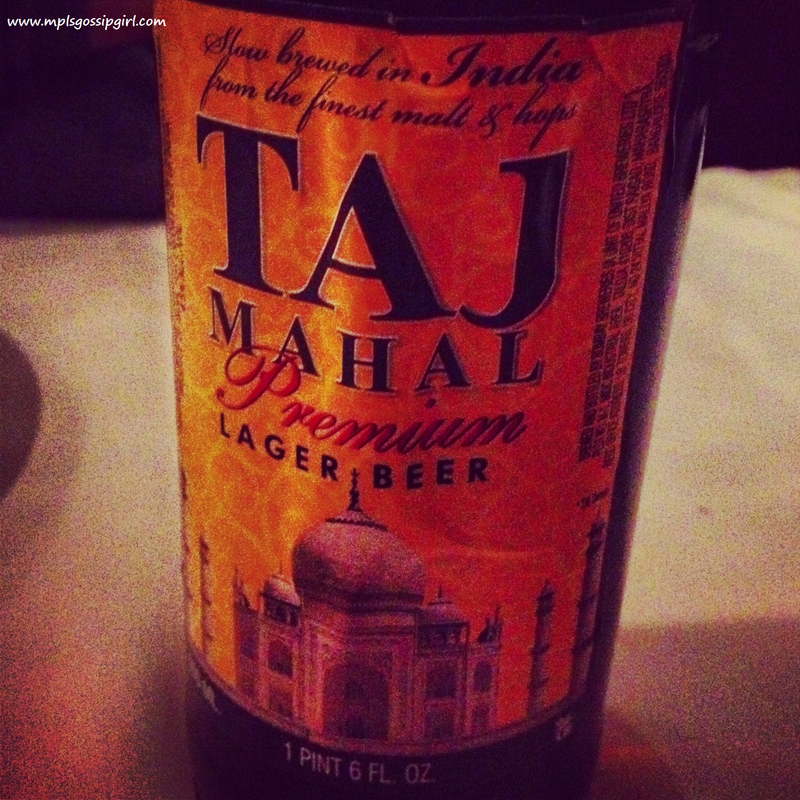 I had the Taj Mahal which went nicely with the food. Not the best beer that I have ever had because it is lighter in nature but, paired well with the lamb. Overall, this restaurant gave me the home cooked meal feel. It was warm and inviting. Be prepared to wait awhile for your food since the service is a little slow. It didn’t really bother me at all. They have several other locations in Minnesota as well. In the future, I want to travel to India. Until then, I will have to do with eating at India Palace. 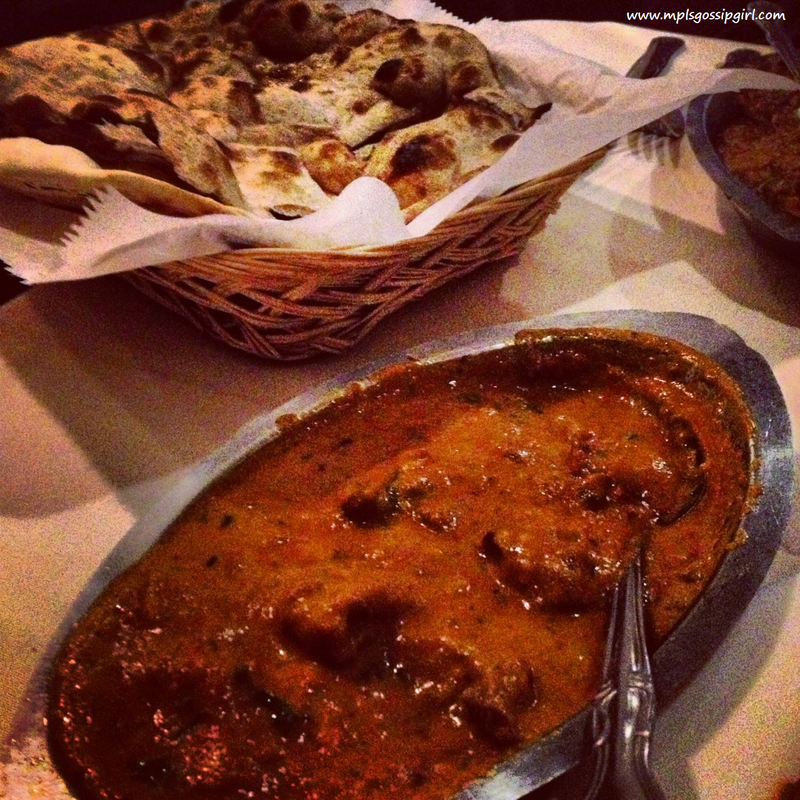 What is your favorite Indian restaurant? because I like it spicy! I have not! I will add it to the list. What should I get if I go there? Haha. I always ask the servers what they like. I am glad that you haven’t had a bad dish. It is a sign of a good restaurant. I have enjoyed the buffet at the Burnsville location. My husband works with several Indians who recommend this place highly. And now I’m hungry. I’m no expert on Indian food either. But I’ve eaten at Chapati in Northfield and loved it. Also have eaten at Sai Ram in Appleton, Wisconsin. Great food. Have tried an Indian restaurant in West Fargo (can’t recall the name), but was not impressed by the buffet the one and only time I dined there. I have heard that Chapati is great. I am going to have to try it. I don’t get to that area often but, it sounds like a fun trip to take. God I love Indian… I was lucky enough to go to England this past November, and I INSISTED one night we eat Indian, so the night we met with an English work-friend of my Mom he brought us to this awesome district with all-authentic stuff. The best part was that we went as a group, so we got aallll these different dishes to try and share, I was in Indian heaven. As for local, it’s probably not quite the quality of other Restaurants (by the way, I wish I was eating at India Palace right now thank you very much, that looks exactly how it ought to), but Ghiradelli Plaze, Food Court, there is a stand called “Kabobs” that blows all other Food Courts places away. For one, they actually make their own food, as opposed to the from-the-bag allways-the-same Chinese places. But the best part, $5 Lunch Platter, you basically go down and get ANYTHING YOU WANT, so you can LOAD up your plate with awesome food for cheap. My favorite lunch spot, period. I have never been to England but have heard that the Indian food is great there. Glad you confirmed it. I have never heard of that place. “Kabobs” will be my next lunch destination. It is too bad that I can’t get out for lunch much otherwise I would be there today. Agree with this completely, after Udupi closed down this became one of our favorites. Gorkha is also delicious! There is also a great place in SLP that I can’t remember the name of but is located in the Texatonka plaza…. Near Than Do.